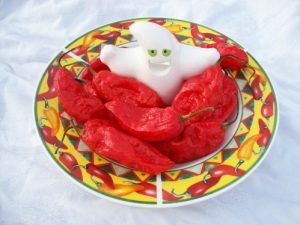 Before we describe this controversial pepper lets look at the history. 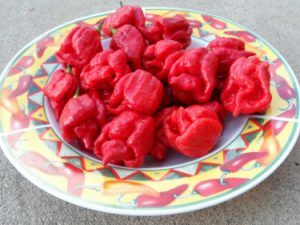 Chad Soleski an expert grower from Wisconsin made the first pepper coined the name Bhutlah. 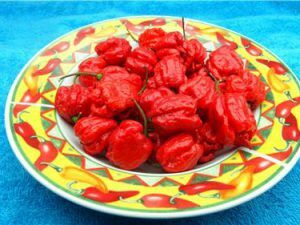 It was a cross between the Bhut Jolokia and the 7 Pot Douglah. Later some got a Brown or Chocolate variant and named it the Chocolate Bhutlah. It got its fame because back in 2013 a Video reviewer named Ted Barrus ate a very, very large specimen. Keep in mind that a larger pepper has more oil so will do more damage. After that the person who sent him the pepper claimed the name. Also it was rumored that a third type was crossed into it which may be true or not. 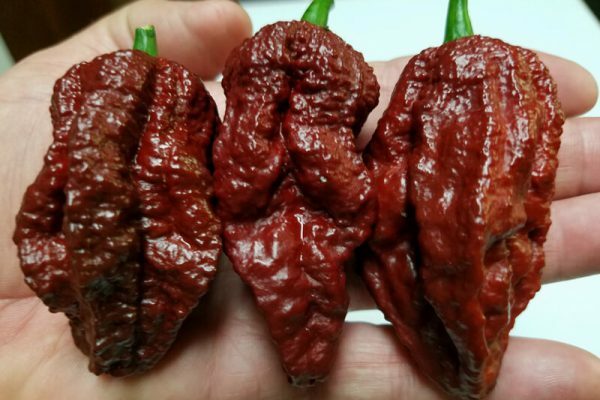 Regardless of what people say it can never be proven that a pepper so young actually has a third variety in it’s genetics. Seeds were shared and so now many of us have it. Can you prove we are not growing the original? Can we prove we are growing the original? Let’s cut the crap and end the debate as nobody can prove anything. 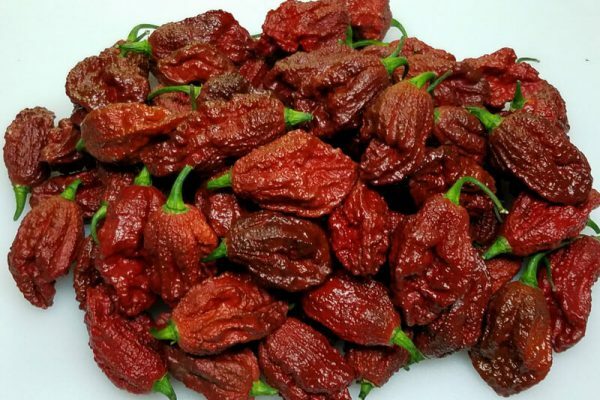 The Chocolate Bhutlah is a huge hot variety and we have a version of it. Currently we are growing out Chad’s Chocolate which should be available as seeds end of summer 2016. So we will have two phenotypes or versions. The Chocolate Bhutlah has great heat and grows huge elongated Naga Type pods. The skin is very bumpy and the width is much larger that Nagas or Ghosts. The Chocolate Bhutlah chile plants can grow over 4 feet tall. You will get some variations as again this is a young strain as of 2015. This is the very large version of the Original Red Bhutlah or Bhutlah Red OG. OG stands for original. 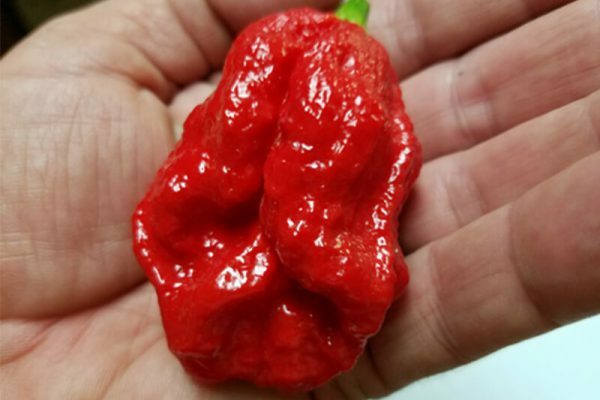 Grower Chad Soleski of Wisconsin crossed a 7 Pot Douglah with a Bhut Jolokia and got a mean bumpy red pepper later named the Bhutlah. This is the original from the creator himself. It has a mean heat and resembles a spiky bumpy Naga type. The background flavor is similar to red ghost peppers. The Bhutlah Red Large chile plants grow over 4 feet tall. 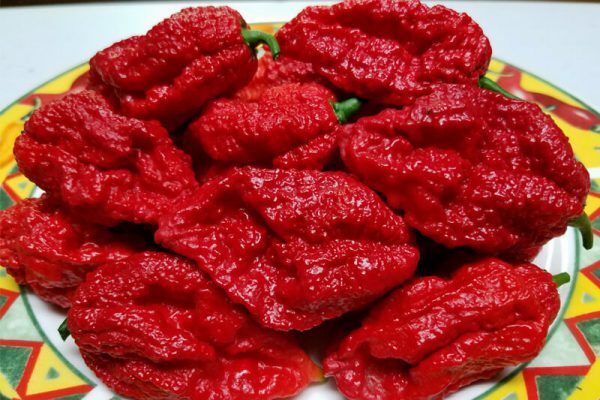 The first ever Bhutlah variety was created by Chad Soleski. So CS is his initials. It was a cross between the Bhut Jolokia and the 7 Pot Douglah. His friend Steve gave it the nickname Bhutlah. It was a Red color but then later Steve and others got Chocolate variants that were much larger than the original red variety. Chad finally got his own Chocolate type and this is it. It does not make as large a pepper as the other Chocolate Bhutlah. But it is more consistent in shape and size. It is just as hot and much more productive. The Chocolate Bhutlah CS has smoky fruity tones. The Chocolate Bhutlah chile plants grow over 4 feet tall. OG stands for orginal. 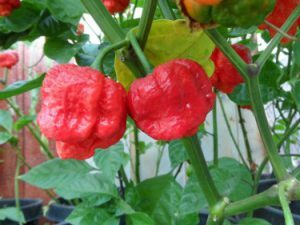 Grower Chad Soleski of Wisconsin crossed a 7 Pot Douglah with a Bhut Jolokia and got a mean bumpy red pepper later named the Bhutlah. This is the original from the creator himself. It has a mean heat and resembles a spiky bumpy Naga type. The background flavor is similar to red ghost peppers. The Bhutlah Red OG chile plants grow over 4 feet tall.